A Murphy Rebel builder forwarded the comment below in brown from the Murphy builders list. He was interested to know how I would respond to the writers comments. Rather than send back a private email, I thought it was worth putting up here, as we have about 10 builders putting the Corvair on the front of a Rebel, and I wanted them to understand why we know the combination will work, and why the guy below is not correct in all the assumptions he wrote into a single paragraph…..
“I seriously looked at the Corvair engines – but decided that with the wide front end of a Rebel – that the faster turning and therefore smaller diameter prop’ ( which you HAVE to use – in order to let the engine get up IN to it’s power band RPM range ) would be “inefficient” on the nose of such a meaty plane ( big front end ) ……. Where do I start? OK, I’m not fond of the term Lycosaurus, even when it is used by people planning on buying a Lycoming. Moving on to more technical points, the biggest single argument, and the easiest thing for new builders to understand, is that we have long been successfully flying a plane that is bigger than a Rebel, has more frontal area, more drag, and a greater payload. Our Wagabond, flying since 2005, works great and actually flew with more payload than it’s empty weight……On a 100HP Corvair. So maybe the comments that the writer made don’t count. Simply put, his evaluation was based on his eyeball look and a handful of old wives tales, on the other side we have my testing and a plane that has been flying for 8 years. O-235 vs 3,000 cc. The 235 listed above makes 116hp. If I asked the writer what exactly he ment by “with it’s slower turning / bigger diameter / more efficient propeller !” He probably wouldn’t have an exact number in mind for rpm. Does 2,800 rpm sound real slow? Well that’s the rpm required to get 116 hp. Think I have been an A&P for 20 years and don’t know what I am talking about? Read the last model on the Wikipedia page: http://en.wikipedia.org/wiki/Lycoming_O-235. Also note that just about every 235 has to hit 2,800 to make rated power. Second, a fully dressed 235 weighs 280 pounds, at least 40 pounds heavier than a Corvair. A 235 is wide, within 1/4″ of the width of a 320. You can’t put a sleek cowl over it. Now lets look at prop size: Think more diameter is always better for low speed thrust? Think again. Last week I changed props on Grace’s 85 HP Taylorcraft. I am setting it up to tow our glider. It had a 72 x 48 wood prop on it, and I got a 74 x 46 metal to replace it. But before I mounted it, I took it to American Props and paid $865 to have it overhauled, the pitch reduced, and to have its diamerter reduced to 70″. I am not a fool, The diameter reduction allowed higher rpm, and improved the climb rate by 500’/min. Props with diameters of 74″ are only efficient on engines like the Continental 65 with a low red line of 2300 rpm. Low rpm isn’t efficient in itself. A 65 Continental becomes a 75 continental with respect to power output by just a jet change and an RPM increase to 2600. If turning the prop 300 rpm faster and using one with less diameter actually made less low speed thrust, than no one would have ever converted a 65 to a 75. Almost everything repeated in hangar flying stories or on discussion groups about rpm and efficiency is an old wives tale or pure BS that directly contradicts experience from certified engines and certified prop shops, but that never seems to stop people from repeating it as if it was told to them by Wilbur Wright and Kelly Johnson. A 3,000 cc Corvair on a big plane can use either a 68 or 70″ in diameter prop. 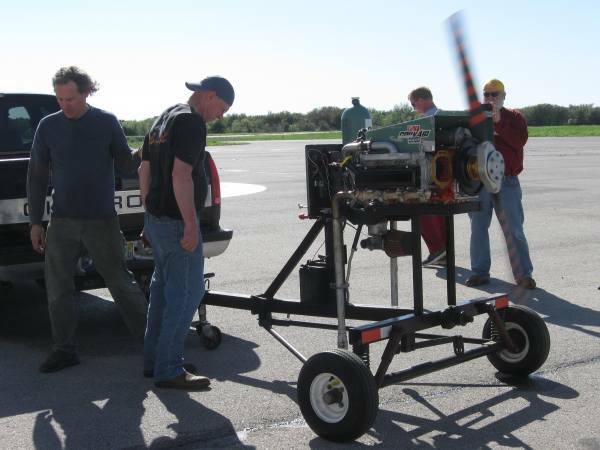 If the guy puts a 74″ prop on his 235, it is going to static near 2250 or 2300 rpm, 500 rpm below the engines rated power. 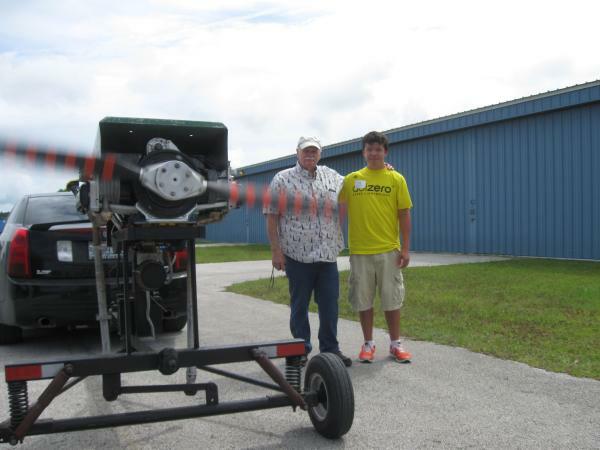 He may tell people he has a 116 hp engine, but he isn’t going to get to use the last 12-16 horses unless he takes the diameter down to 70″ or so. Lets see…where is that big prop diameter difference the guy was speaking of? Yeah, it’s 2″, but don’t forget the Lycoming is 6″ wider, so which prop is operating with more blade area working in the clear? Above, the wagabond outside our old hangar in Edgewater in 2006. 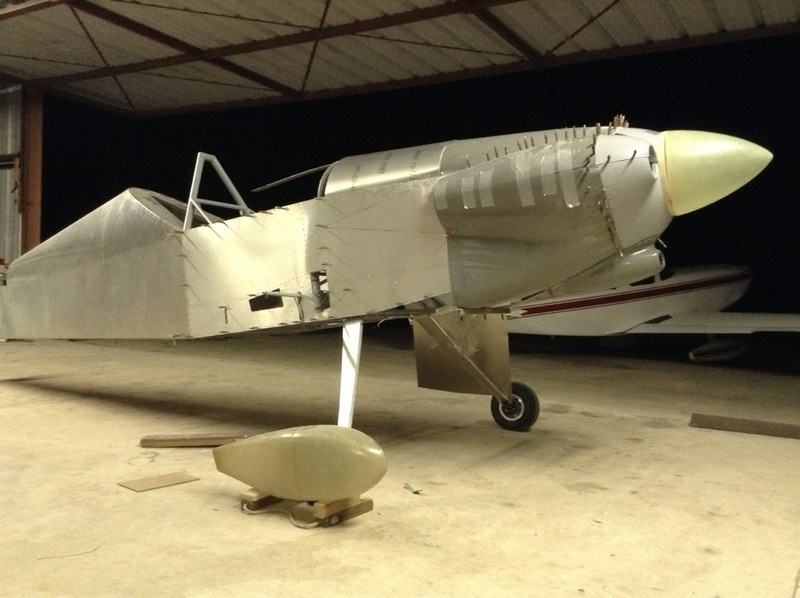 It is built on a PA-22 airframe, which as a four place certified plane. It is bigger than a Rebel. It has taller gear, it has four lift struts, and at 147.5′ of wing area, it has just 2.5 feet less than a Rebel. In short, there is no rational reason to say that a Rebel would not fly as well or better on the same engine. In the photo, the plane is equipped with a basic 2,700 cc Corvair. Look at the prop, it is a 64″ diameter wood Sensenich. It worked great, it is using the same prop in the video link at the end of this story. The picture above is just after Gus did the first flight in the plane in 2005, he is shaking hands with Dave. You can’t tell these things in pictures, but both Gus and Dave are about 6’3″ and they are both built like NFL defensive linemen. The empty weight of the plane was 804 with a 2700cc Corvair. We arbitrarily set the gross weight on the paperwork at 1320# to make it light sport compliant. We did a test flight at 1625 pounds during phase one. I was not worried structurally because we used a PA-22-108 colt airframe as the basis of the plane which has a gross weight of 1650 pounds. The lift struts are off a 160 hp tripacer with a 2,000 pound gross. The plane is not a speed demon. its fair to say that it will do 100 mph on 5 gallons per hour. It 100 hp climb rate at 1320 pounds is about 700 fpm on a standard day. Note that this is about the same as the 235 powered Rebel on the chart above. We are currently redoing the plane with some detail work intended to clean it up and repower it with a 3000cc Corvair. I am shooting to bring down the empty to 780 pounds or so. I have a 68″ Warp Drive for it. We are planning on bringing it to Oshkosh this year. I will gladly fly it against any 235 Rebel from standing start to 1,000′ agl. A smart guy with a light Rebel and a cut down prop would show very well against the Wagabond. But if the Rebel builder was the kind of guy who spent his time listening to old wives takes and bought a real expensive, big slow turning prop for his Rebel, It won’t be a contest at all. A small number of people who read this will “get it.” The majority will not question the old wives tales they have been spoon fed over the years. They will not even stop to consider that none of the people who told them the tales had done any testing, had any education on the subject, or had put any real effort into learning. I have been sharing this type of information for 20 years, and still people say “I seriously looked at the Corvair engines” but evidently they don’t look close enough to really understand how engines and props work. I used to wonder if I was doing a really poor job of sharing the things I had learned, because a lot of people still said things like the writer. I was operating under the false assumption that everyone in homebuilding wanted to really know how things worked, wanted to see the real tests, was willing to change their point of view if the facts indicated something different that their previous assumption. The next piston option we are going to look at is one we developed in-house, as a purpose-built, clean sheet of paper concept, to bring advanced combustion characteristics to Corvair flight engines. Most people who work with engines understand that the shape of the chamber in the head has a great effect on how an engine runs, particularly in challenging circumstances like aircraft. What a lot of these people miss it that at top dead center on the compression stroke, the head chamber is only half of the shape of the remaining space, the top of the piston is the other side of the equation. While a flat top piston works in many cases, it isn’t the optimal design to compliment the combustion chamber in flight engines. Flat top pistons are less expensive to make, but if you are willing to go a bit further, there are significant advantages to be had. If you’re talking about putting the piston in a plane, the single most significant advantage is detonation resistance. If you think that you would like to run auto fuel extensively, using a piston like the designs we have in 2,850s and 3,000cc Corvairs is a very significant advantage. Regular flat top Corvair pistons can be run on auto fuel, people do it every day. Smart people doing this reduce the timing of the engine and enrichen the fuel mixture slightly, and resist the temptation to aggressively lean the engine. These things provide the margin of safety. On a 2,850 or 3,000 with our pistons, the margin of safety is provided by the shape of the piston head, and there is no reduction in performance required to have a very wide margin on decent auto fuel. The set comes with their own pins in the kit. Pistons are set to use either standard Corvair rods or ones bushed for floating wrist pins. The rings that come with the kit are made by Total Seal, and they are specified by the Piston maker as the optimal ones for the piston design. The rods that come in the kit are standard rebuilt ones with ARP bolts. Most of the kits we have sent out have had the pistons mounted on Clarks 9203ww rods, some of the kits were delivered with upgraded rods with 12 point ARP nuts. We mount the pistons on the rods for the builder. The Cylinders in the kit are the Clark’s HD, full fin, brand new ones. Clarks has these cylinders in many sizes from STD to .060″. The 2,850 is bored .105 over and requires the boring bar to make several passes to get it his big, thus they cost more than the same cylinder with a smaller bore. A replacement 2,850 cylinder is an on the shelf item at Clarks, and has it’s own part number, C-11628ww. The Cost is $84. The six cylinders are part of the kit price. For all 2,850s the standard head gasket that we recommend is a .032” solid copper gasket. These are available from Clark’s, part number C-3946 The head gasket set is about $30. We sell the 2,850 kit for $1,750. The gaskets to complete Groups 1300 and 1400 bring the total to $1,822. Notice that this is $827 more than a 2,700 builder will spend. What is the attraction? First the combustion chamber shape, second the pistons are even stronger than the sealed power ones, third, up to 9 more cubic inches, and fourth, that the cylinders are new. If a builder had 3 or 4 core cylinders that have chipped fins, paying the core charge from Clarks gets part of the way into the price difference. If a builder is considering leaving the option open for turbocharging later, this is a much better combination to work with than a 2,700. Below, some photos and commentary about the builders who are using 2,850 engines now. Above, a drop forged, made in the USA piston for the Corvair. The displacement of this piston is 2,850 cc. Look at the dish in the head of the piston. Notice that it still has a quench area to match the one in the Corvair head. This piston is designed to allow the head gasket step in the head to be completely cut out, have a quench height of only the thickness of a .032″ head gasket, but still have less than a 9:1 compression ratio with a 110 head. With a 95 head and the quench clearance equally tight, the compression ratio is below 8.4:1. The former should be an ideal engine to run on unleaded gas or 100LL. The latter is specifically set for being run with a turbo, or with standard auto fuel. I like the concept for a number of reasons. It is the largest bore that can be used without modifying the case and heads, the way you must with a 3,000. the ready availability of Clark’s new full-fin cylinders that can take this kind of overbore eliminates any special machining to the cylinders, other than boring them .105″ over. 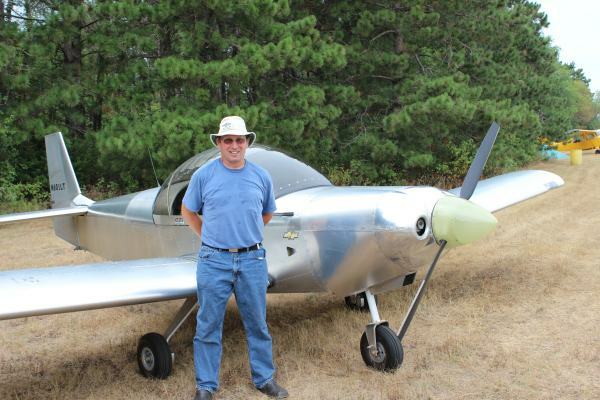 Above, Ron Lendon of Michigan flew in to Brodhead 2012 in his scratch built 601XL. It was originally powered with a 2,700 but he later upgraded to a 2,850. Above, Clarence Dunkerley at Corvair College #21, beside his 2,850 which we later ran. The engine is now installed on his completed Cleanex. I just spoke with Sebastien Heintz, President of Zenith, and we would like to have a Corvair powered Zenith in the Zenith aircraft display area at Sun n Fun. We have a long tradition of doing this going back to 2004. Sebastien always likes to see affordable examples of his families designs prominently displayed. In the last nine years, between Sun in Fun and Oshkosh we have had about a dozen of our builders planes in their booths. We are not looking for show winning aircraft only, regular examples of traditional builder craftsmanship are actually prefered. My Commercial display comes with a number of full week passes. Anyone with a plane in the Zenith booth will be an informal rep for Corvair power, so I will cover the pilots of the display aircraft with complementary commercial acess passes. Even if you are able to stay just part of the week, we are looking to cycle 2 or 3 Corvair powered Zeniths through the booth. The Zenith display is in the middle of the broad taxiway, so there is no difficulty moving aircraft midweek , after hours. We do not need a guarantee of being on hand, I just need to hear from Zenith pilots who are planning on attending Sun n Fun so we can do a little coordination and planning. Above, Rick Lindstrom’s 601XL in the Zenith Booth at Sun n Fun 2007. Grace, Chris Heintz, and myself with our Zenith 601XL at Sun Fun 2005. Grace and I have decided to return to Sun n Fun again this year. This will be my 25th consecutive year at the event. We will have a full commercial display, in booth N-66, which is on the row in front of building “C”, the third of the four main display buildings. This is one row over from where we were last year. Sun n Fun is the second largest air show in the US, and it has been held every spring in Lakeland Florida for many decades. It is a big event, and it draws thousands of planes. Dan and Rachel Weseman are bringing the Corvair powered Panther prototype to the event, and they have an adjoining commercial display space, so we will have a place for all the Corvair builders to congregate. 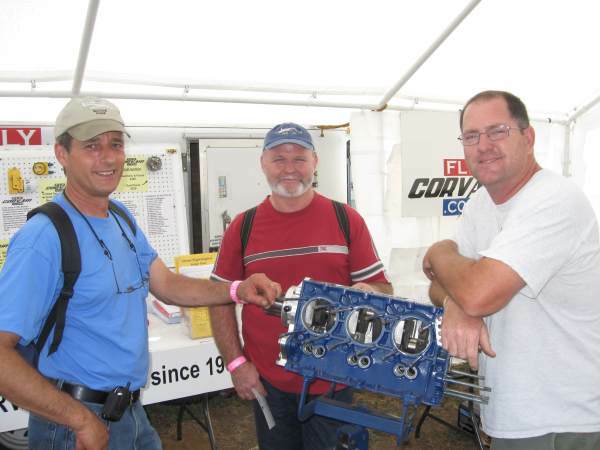 Just as we did at Sun n Fun and Oshkosh last year, we are going to work together to have a Corvair Cookout for all builders and fans of the Tonawanda master piece. There will be a one day gap between Corvair College #25, held April 5-7th in Leesburg Florida (more info later this week) and the start of Sun n Fun. We expect to see many builders at both events. We are tentatively planning on having the Cookout on the first night of the show. We will keep every one posted as we get a little closer. We will do all the regular stuff, parking lot tours to look at builders cores, have every catalog part on display, have short blocks for sale, etc. If you are going to attend the event and have a specific question or would like to pick up something special, just drop us an email or call. New Panther Cowling, shown in pictures. Below is a picture of Dan’s new Panther Cowl roughed in on the front of his prototype. He and Rachel did this work over a 7 hour stretch on Sunday. I stopped by their hangar and saw it at this stage. It looks even better in person. The interesting side of this story is the method that Dan selected to produce this cowl. In short, he started with a RV-3 cowl and a Cleanex nose bowl and a very good imagination because very few people could picture how he was going to bring those together on the front of a single place aircraft. If you follow the link at the bottom, you can see the actual step by step process. There is still a lot of work to go, but this part will have been vastly faster to make than a traditional cowl made of carved foam blocks or plaster.